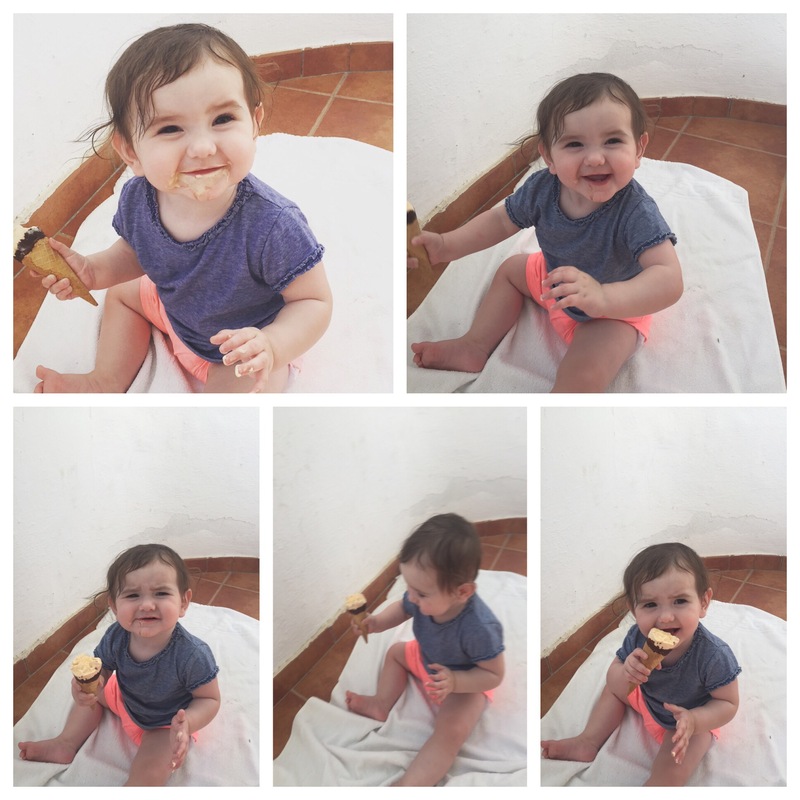 Last month, Sam, Emily and I returned from our week away in Southern Spain. As we arrived at Gatwick and looked out to the shiny bright light that was the sun, when those doors opened, the cold air that hit, sure reminded us we were no longer on holiday anymore, in holiday mode and heading towards home, meant doing a mountain of washing, going back to work and snapping back into reality. I’ve only just finished putting all the washed clean clothes away. Spain was good, nice, what we all needed. I was so stressed with work, up to my eyeballs in stress, worry, the usual. Sam was exhausted from work and the travel inbetween and Emily was agitated. We all just needed the break and it was nice to get away, even if it was bloody boiling every day! We flew out on the 6th of September from Gatwick at a God-awful 7.15am, which, we’ll admit, we’ll never do again, not with a baby that’s for sure, the tiredness, and the dumb decision to hand over the buggy when we checked in our luggage was all daft decisions we made, which we definitely wont be making again. Note to all parents who think they can just pop their little one into a baby carrier and Bob’s your uncle, NO. It’s bloody painful, my back ached for weeks after and Emily refused to go in it once she started falling asleep so I had to carry her through security and to the gate. Dumb idea, really really dumb. 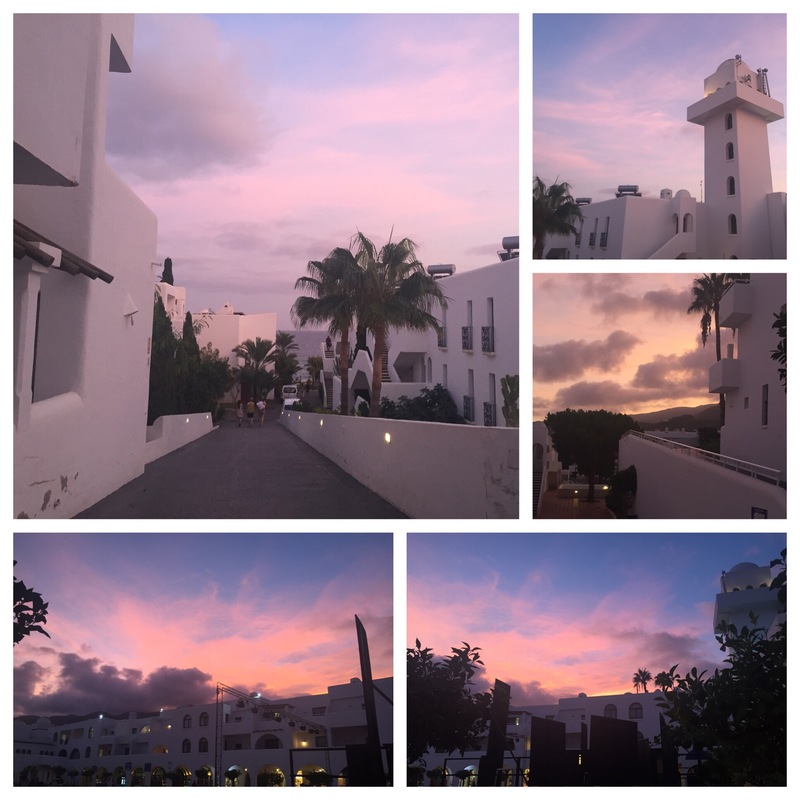 We stayed at the Pueblo Indalo in Mojácar, which is not pronounced the way we thought. It’s not Ma-your-ca like the island its Ma-hack-car. 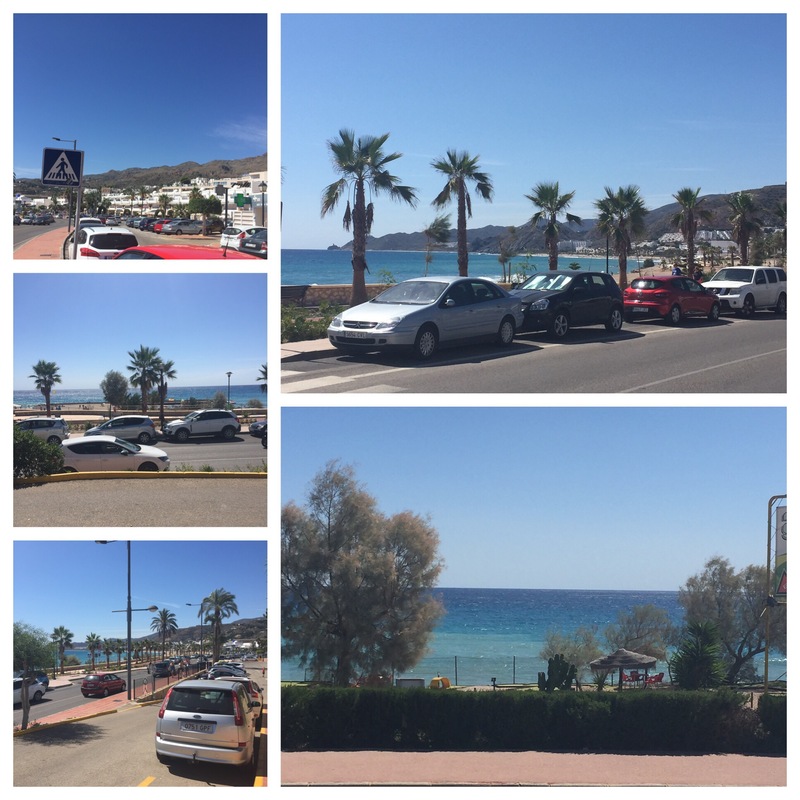 Mojácar in the south-east of the Province of Almería (Andalucia) in southern Spain, bordering the Mediterranean Sea. It’s a nice area, but very hilly and very hot, but mostly known for its mountains and hot climate. Our hotel was OK. For the money we paid, we got a good deal. But it’s very Spanish, I mean obviously we were in Spain, but there were like two people there who actually spoke English beyond broken English, which had been unhelpful at times. When we checked in, the lady on the reception said “you’re on the ground floor, no lifts….but walk up the ramp and you’ll be in your room.” But our apartment was on the first floor, up 5 steps, which was a bit of a bugger with the buggy, and someone in that hotel needs to look up the definition of a ramp because that ramp was more like a bloody ski slope. I’m surprised I didn’t lose a lot of weight climbing up that ramp every day! The apartment was nice, a one bedroom apartment, with 2 single beds, which we pushed together, a travel cot for Emily, a good amount of closet space, a good sized bathroom with a bath/shower, a nice kitchenette with a fridge that led onto the sitting room with TV, sofabed, table and chairs and a little balcony. A good size for a family of three. The air con in the sitting room only worked when the balcony door was closed and chilled the apartment within minutes. The whole apartment was a Godsend when some days the heat was just a little too much. The hotel complex itself was big. Split up into apartments in villa style buildings and hotel rooms that either look out onto other villas, the sea, the mountains, the terrace or the pool areas. There’s limitations on what to do around this hotel with a baby so young. 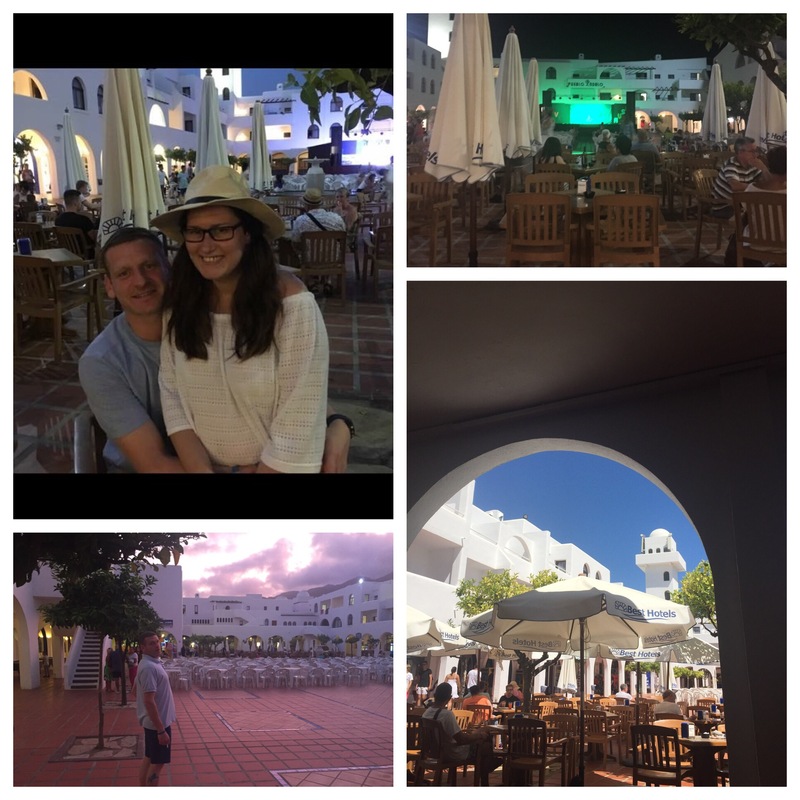 Whilst we did bump into a few other parents of children similar ages, they did either have an older sibling to be with or grandparents to entertain them as their parents went off to flamenco dancing for date night. Everyone flocks to Pueblo Indalo and I can see why. This hotel/apartment complex is massive, there’s two onsite restaurants serving buffet all you can eat for €12 or €7.50 for children, serving mostly the same, except one restaurant is a lot more casual than the other, but a wide selection of hot and cold meats, grilled fish and meat, pastas, fries, veggie, fruit and sweet dishes. There’s also daily entertainment for all the family- Thursday night we watched Frozen in Spanish – in the wrong order, I’ve seen the movie enough times to know which scene comes before what!- Friday night, Mama Mia and Saturday night was a very odd Circus act. I don’t know how the staff who entertain these kids do it. They have so much energy because it’s a continuous thing, whilst the kids can’t get enough, it would surprise me if half the entertaining staff had drink problems. A continuous performance of happy smiles, singing, dancing in fluorescent tutu’s, clapping hands and singing the same song day in and out to a bunch of screaming 6-12 year olds. Fair play to them, but rather them than me! There’s a few shops around the huge square (where all the entertaining happens), a supermarket, two big swimming pools for the older kids and adults and two children pools, a kids play area, a kids club, and a few bars where their drink measurements in the UK would probably cost you your job. 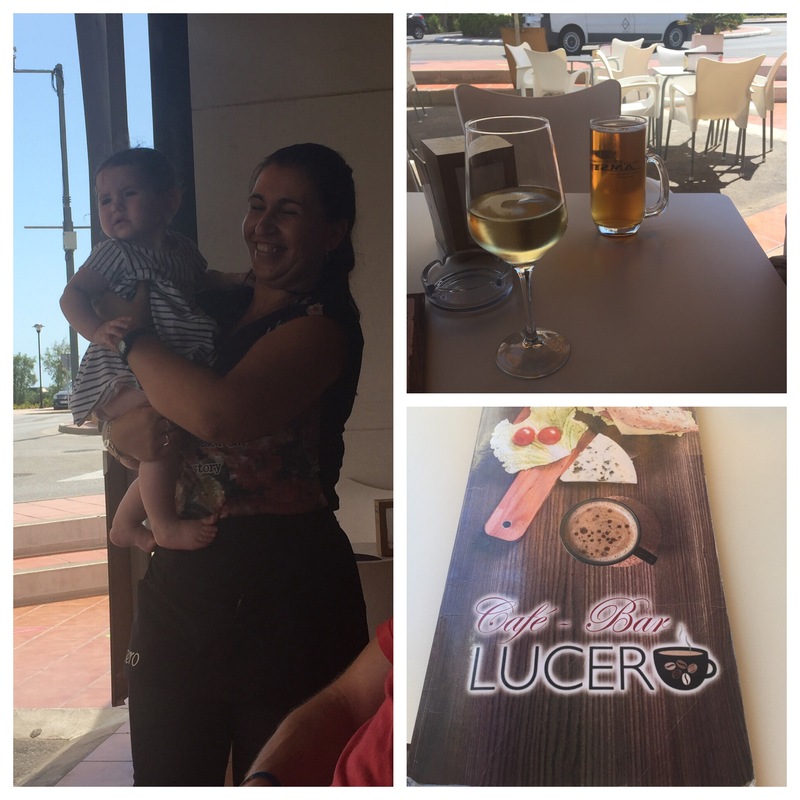 We were looking for a different restaurant funnily enough and stumbled upon this great little bar/restaurant a 10 minute walk from our hotel and we’re pleased we found it. Opened by British couple Peter “Scotty” Scott and his wife four years ago, they offer British favourites, some local dishes and a good old Sunday roast with all the trimmings and homemade gravy on a Sunday. This popular eatery is a favourite amongst locals, returning visitors and new tourists like us, who want a taste of home, with great company and a lovely view. 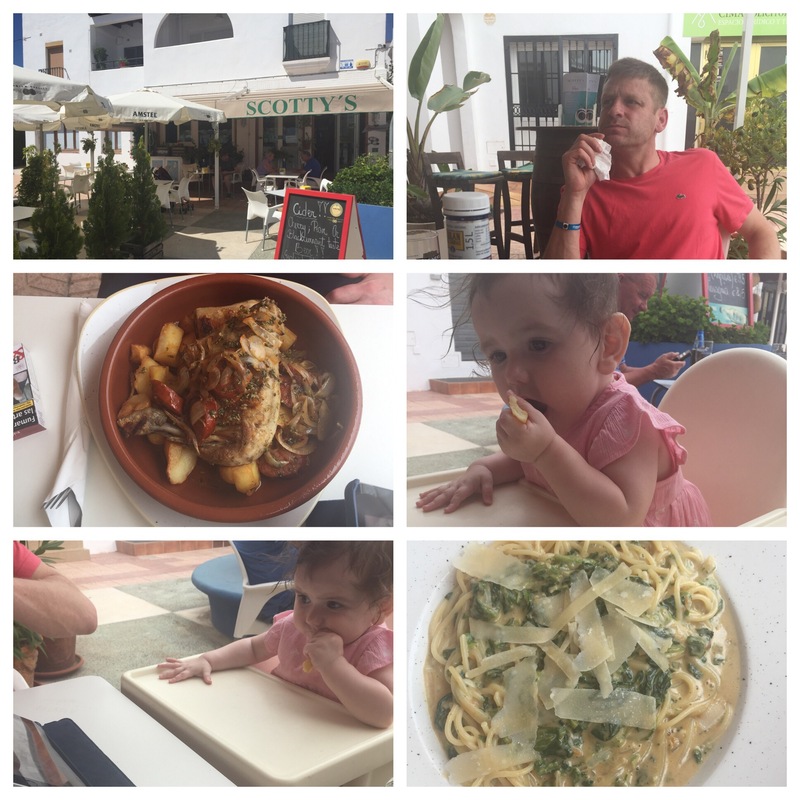 We visited Scotty’s three times, once for breakfast and twice for lunch throughout our stay in Mojacar. Offering a selection of hot and cold foods, tea in a mug (makes a change to the little tea cups back at the apartment), and hot, cold and alcoholic drinks, this is a fab place for all the family. The waitress loved Emily, who Emily loved back, and all the team are always friendly and chatty. If we do come back to Scotty’s we’ll definitely be returning here. After a long slog of a walking journey one morning looking for an exchange bureau that took cash, we found this lovely place. 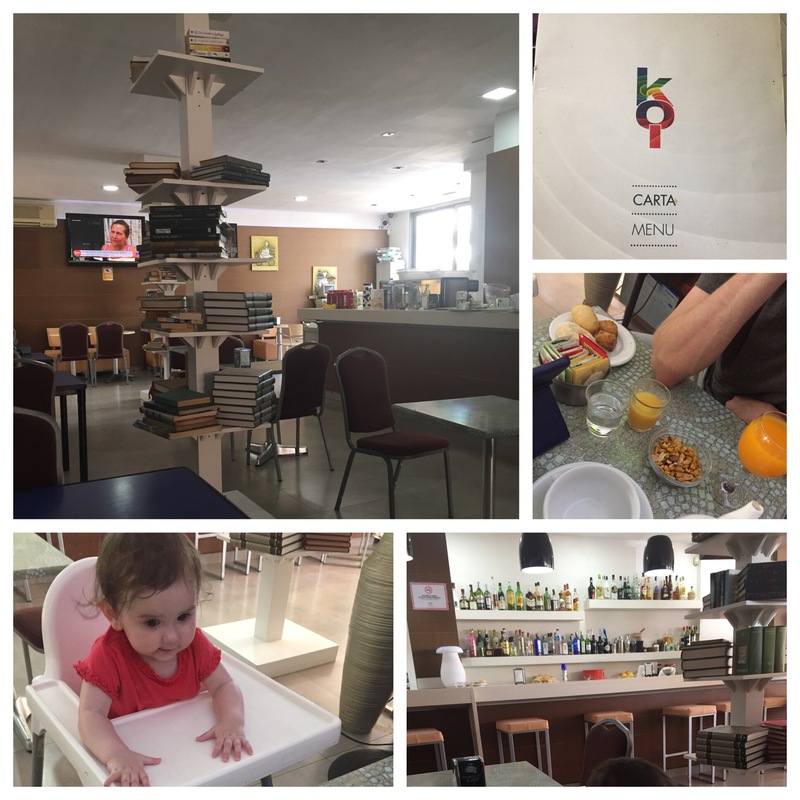 The Koi Café Bar is just off the Main Roundabout as you enter Mojacar Playa. A good sized eaterie with space inside the cafe, outside and in the garden. I loved this place. The staff are really friendly, again a huge hit with Emily and the inside interior reminded me of all those cool bookstores in London and New York, cool wallpaper, white walls, quirky bar, spacious with pillars of old and new books in Spanish and English. You can get a full English breakfast in here for €5.50 and lots of delicious sandwiches for €4 that came with chips or salad. Before we even ordered the waitress brought off a delicious selection of home baked goods, sweet treats and nuts alongside water and juice whilst we decided what we were going to have for lunch. This was also a great little find. Serving hot and cold drinks and food, this place welcomes English and loves children, as you can see from the waitresses delight above. Emily, clearly a favourite with the locals, serves affordable food and meals and you can get a decent equivalent to the English breakfast. Bring lots of sun protection. Doesn’t matter where you’re going, even if mild or boiling hot, make sure Baby is covered up with a good SPF. As Emily is very fair we weren’t in the sun during the day from 10am to 4-5pm, depending on the day it could be later. At all times Emily had a 50SPF that was effective against UVA and UVB. Swim nappies. No joke make sure they fit your baby the day before you leave. We spent about €20 on swim nappies. We kept going to the chemist to try and figure out the translation of Spanish to English what sizes of nappies they had. The shop assistant although could speak English hadn’t a clue either. Blanket. We brought along Emily’s favourite fluffy blanket. We had a spare just in case but every night she slept with her blanket whatever the weather. Bath toys. In our apartment we had a nice bath/shower in the bathroom. I bought a few of Emily’s favourite bath toys and wash cloth for her to play and chew on when it came to her bedtime routine. Formula. Stupidly we only brought one tub of her formula with us. Because of the heat Emily drank more often, whether that be formula or water and rarely had any interest in food. Because she was drinking more formula, we started to run out after a few days. 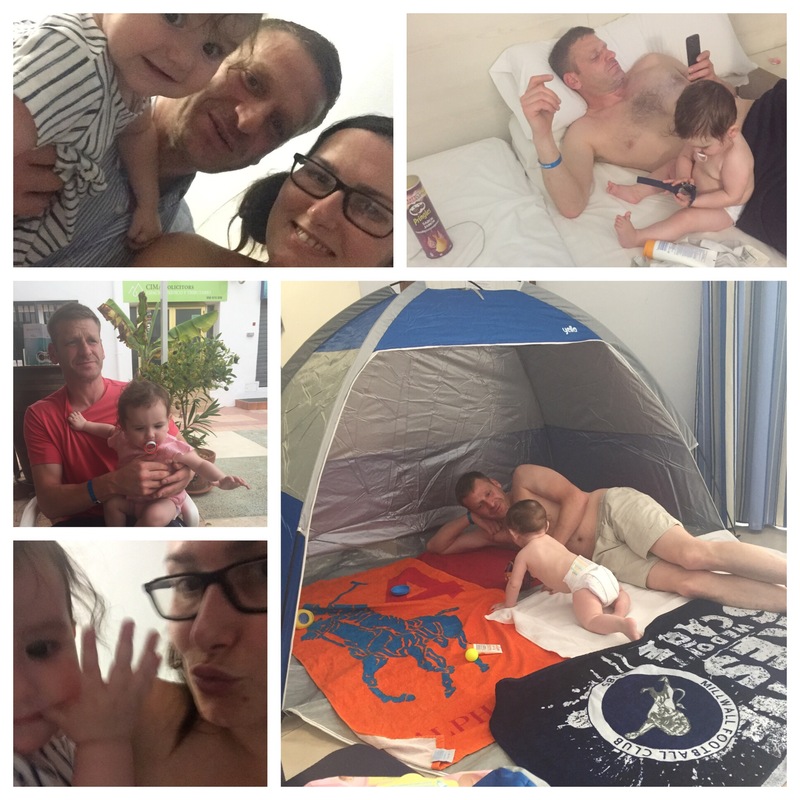 Thankfully we bought a Spanish formula which Emily took to well and we were covered for the rest the holiday. The only downside was having to pay €18.50 for it! Bring warm clothes. Although the temperature stayed pretty much the same throughout the day in Southern Spain, some evenings it got quite chilly. Having some extra clothes or those ‘just in case’ moments are essential. Bring your bottle sterilising/cleaning kit with you. Thankfully I remembered to bring some sterilising tablets with me in my suitcase. They are easier to pack instead of a bottle of sterilising liquid, which can on occasion leak if the cap hasn’t been screwed on properly. I also brought the bottle cleaning brush and made sure I had her 2 bottles with me. I had deliberately buy a bottle in pink and blue so not to lose either. Bring a first aid kit. My suitcase had plenty of plasters, nurofen for adult and baby, baby ear plugs, dummies, soothers, baby bonjela, teethers and after sun to last a month. Snacks. Snacks help wherever you go during the day and seriously help when you’re out and about and your little one isn’t interested in sharing some of your food. I bought some of her Organix and Kiddilicious treats. Baby wipes. You can never have enough baby wipes. I packed about 4 packs of baby wipes in our suitcase and then another 3 packs in our hand luggage. iPad. I can’t live without my iPad anyway. Just before we left for our trip I downloaded a series of Mr Tumble onto the iPad alongside the series of Hey Duggee to entertain Emily if she ever got bored. Buy a proper swimsuit for your baby. As cute as it is to buy a frilly little suit for your baby, a proper all-in-one is ideal to protect them from harmful suns rays. Think it’s a great idea to fly out at 7am because you think you’ll get a day at your destination. It might work when you’re single travellers but once you have a bouncy baby with you, that all changes. It took a few days to get over our journey both ways. Be an idiot like me and hand over the buggy when you check in your luggage. It will kill your back. Just decide there and then with your travel agent. I wish we properly researched into our destination and the place we were staying at. Considering that I work in social media and have experience in recruitment, I’m baffled at myself that I didn’t even think to research before handing over our money, but nevermind. We’re looking forward to what we decide to do next year. We have a plan to go over for a long weekend to visit my auntie who has just moved to Ireland, a place I hold close to my heart but haven’t been in 20 years (another story). As for our summer holiday, we’ll have a proper look into somewhere, not as hot as this trip, somewhere we can all enjoy doing something. Emily will be walking by then and it will be nice to be able to do things during the day together as a family. Previous Post We returned from holiday and got sick, bloody typical!